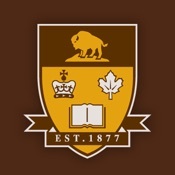 Use the UMLibraries Self-Checkout app to check out items from University of Manitoba libraries. Available for Apple, Android and Blackberry. Available for Apple, Android and Blackberry. Visit your app store to download the UMLibraries Self-Checkout app. Download the app and open on your device. The app will be activated and automatically connect to the library that you are using. Touch “Start” on the welcome screen. You’ll be asked to enter your student/library ID the first time you use the app. Library staff are available to help if you have questions. To check out an item use the “+” button in the checkout screen. Deactivate your items at the dedicated self-check app (meeScan) desensitizer before leaving. The app will automatically show deactivated items and let you know when you’re ready to go. Please contact staff at the circulation desk if you cannot find the deactivation station. Touch “Finish” when you are done. Download link for Blackberry coming soon. Fit the entire barcode of the item in your viewfinder. Hold the phone steady. The camera needs time to focus. Don’t get too close. The best distance is around 15 cm / 6 in. Avoid glare. Tilt the phone if necessary. Have more questions? Please talk to U of M Libraries staff.